A common problem for female cyclists is over-reaching for the handlebars when sitting in a neutral position (hands in the hoods and pedaling at a perceived exertion level of 6/7 out of 10). This can lead to a number of issues, most notably: hand discomfort and numbness, shoulder pain and fatigue, as well as increased perineal compression. The problems that can result from over-reaching highlight the importance of an appropriate fit. A number of fit parameters can be the cause; usually it is the saddle fore/aft position and/or stem length. However, there are some underlying structural considerations at play that make this a common fitting challenge for the female cyclist, arising because of female anatomical considerations and frame geometry. Many women have proportionally longer femurs in relation to torso length when compared to men. For women, this can result in a saddle position that is further aft if an ideal relationship between the knee and foot is to be achieved, consequently increasing the handlebar reach. Secondly, the geometry of the frames that many women choose to ride often do not account for these differences in female anatomy. For example, a relatively shorter frame reach, and to a lesser extent, a relatively higher frame stack. Many popular bike/frame brands do not manufacture women’s specific frames (e..g., Pinarello, Cervelo, BMC). In addition, many women choose to ride bikes that are not specifically designed for women for a variety of reasons. Chief amongst these is that the geometry of many women’s specific frames is ‘comfort’ orientated having a relatively higher frame stack. This does not appeal to the competitively minded cyclist. Other reasons include the greater range of competitively priced ‘standard’ bikes/frames that are available and the unappealing, to some, feminised styling of many women’s specific bikes. As a consequence, we see a number of female cyclists over-reaching for the handlebars as there is often a mismatch between the anatomy of the female cyclist and the geometry of the frame being ridden. This case study focuses on an experienced competitive female cyclist, Ms Hannan, who rides between 7 and 8 hours per week. Ms Hannan reported that she was experiencing moderate to severe shoulder and neck pain and hand numbness. An ‘off-the-bike’ examination revealed some mild shoulder and pelvic asymmetries. On the bike it was clear that Ms Hannan was over-reaching for the handlebars. Analysis with our motion capture software showed that whilst Ms Hannan’s saddle position was too far aft (approx. 5 – 10mm), the dominant factor causing Ms Hannan to over-reach was the handlebar position. At this point it is important to note some of the technical specifications of the bike and the fit position. The frame was a BMC Road Racer, size 48. The frame size was deemed to be appropriate for Ms Hannan when considering in isolation her optimal saddle position – saddle height of 684mm and set back of 52mm – a relatively large set back in proportion to the saddle height. As a point of reference the author (male) has a saddle height of 670mm and set back of 25mm to achieve the same neutral saddle fit position. The stem length was 90mm and angle 6%. The handlebars were 400mm wide with a reach and drop of 90mm and 140mm respectively – a ‘standard’ bike set up. A third option of purchasing a different frame with geometry that was more physically suitable was not deemed to be practical. On consultation with Ms Hannan it was decided that it would be simplest to install a shorter stem, despite concerns over the effect it would have on the bike’s handling. A Retul Adjustable Stem was fitted to Ms Hannan’s bike that allowed us to experiment dynamically with different stem lengths. It was found that with the saddle in an optimal position, the optimal stem length was 60mm – a 10mm headset spacer was also removed. The before and after data motion capture can be seen in the image below. On the left we can see Ms Hannan’s position with the 90mm stem and on the right with a 60mm stem. It is clear that in the new position Ms Hannan is not having to over- reach for the handlebars and her upper thoracic region is visibly less stressed. Ms Hannan reported an immediate reduction in shoulder strain and a significant improvement in her comfort levels. Three weeks after her fit, Ms Hannan reports sustained improvements in comfort, with no new troubling symptoms arising. 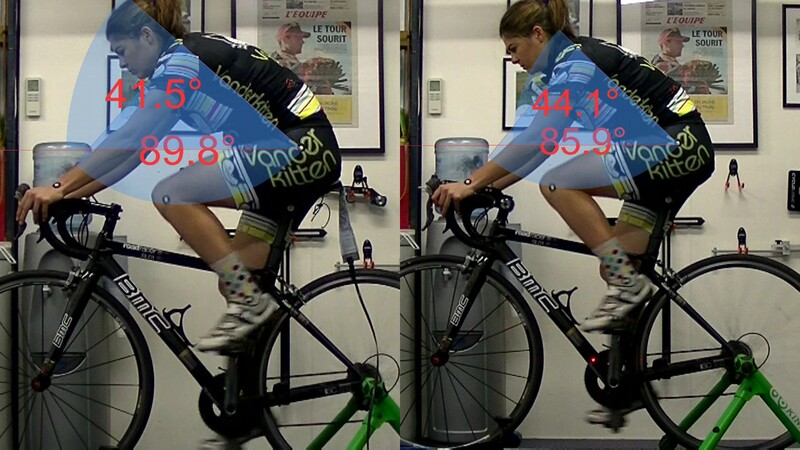 Handlebar reach is a common bike fit challenge for female cyclists due to the potential mismatch between anatomy and frame geometry. However, this problem can be easily, and effectively overcome with the appropriate analysis and tools.